At Rhino Exteriors, we pride ourselves on attentive, skilled installation of quality siding and roofing products in Calgary. We work hard to provide you with the best service possible, and we use products that match our high standards. Rhino Exteriors is proud to be one of the only installers of James Hardie in Calgary. James Hardie is an industry-leading provider of cement siding and backboards. Their products are targeted to specific regions in North America by average temperature and moisture, making James Hardie products the perfect siding for Calgary. We install top quality wood siding manufactured by Canexel. Canexl products are some of the best on the market, and are available in a variety of colors and finishes. Canexel backs its products with a 25-year warranty against separating, chipping and peeling, a 15-year warranty on the finish, and a 5-year replacement that covers the cost of replacement and labor. At Rhino Exteriors, we stand by our service, and we use products made by companies who stand by theirs as well. Wood and Vinyl Siding Installation: We are professional siding installers with years in the industry. We work hard to make sure the job is done right the first time every time, reducing your inconvenience by minimizing the amount of service calls. Soffits and Fascia: The appearance of your house matters to you. New soffits and fascia can go a long way to beautifying your house for a minimal cost. We install both aluminum and wood Fascia. Exterior Decorative Trim: Old or damaged decorative trim can make your house look downright unapproachable. We install trim and other exterior decorative elements onto your house, giving it an updated look. It doesn’t matter if you only need one piece replaced, or your whole house, we take any job, large and small. Aluminum Gutters: Worn out, loose or split gutters can cause water damage to your roof, exterior walls and even the foundation. We install 5” aluminum gutters, ensuring proper drainage away from your home. Aluminum Battens: Old battens are easily damaged, and can make your house look shabby. We install new aluminum battens that can beautify and protect your house. Smartboard Installation: We install smartboard, which is an excellent material for exterior trim. Smartboard is water-resistant and completely maintenance free. If you require additional siding or exterior services, do not hesitate to contact us. We are experienced and qualified to provide a wide variety of exterior housing services. Rhino Exteriors is committed to providing superior service using trusted products. 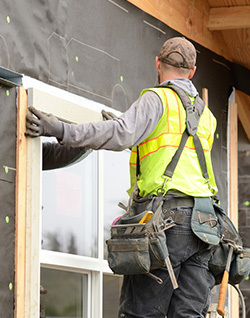 All of our installers have years of experience, and are knowledgeable about all aspects of repair and installation for siding and housing exteriors. At Rhino Exteriors, we can meet all of your exterior service and installation needs. For information or a free estimate, please feel free to contact us. We can provide guidance for projects as well as ballpark figures for any housing exterior project you may have in mind. Rhino Exteriors is proud to offer its fine services to the people of Calgary.